Latest 2015 Kentucky Derby News: Calvin Borel, Jocktails, Live Training Stream– As we close in of the last two weeks of training for America’s best thoroughbred horses, all eyes are on Churchill Downs and Louisville, Kentucky. Justin Zayat reported to the Courier-Journal that jockey Calvin Borel will take the mount on El Kabeir in the 141st running of the Kentucky Derby, the Permanently Disabled Jockey Fund released details on an excited event during Derby week, and the Churchill Downs live stream is keeping faraway fans in the loop with a live video stream of Kentucky Derby and Kentucky Oaks horses training on the track. One Lucky Dane has sadly been removed from the Kentucky Derby starting gate due to injury and Upstart has recovered from his fever and is back to training. American Pharoah: The Zayat Stables colt American Pharoah galloped in the rain under Jorge Alvarez over sloppy footing during the training window for Kentucky Oaks and Derby horses on Sunday, April 19, 2015. 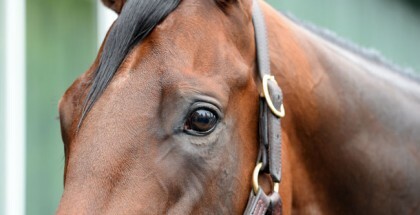 The colt looked alert and eager on the Churchill Downs track despite the rain. Danzig Moon: Assistant trainer Norman Casse said John C. Oxley’s Danzig Moon came out of Saturday’s swift five-furlong work in :58 in good shape. “Everthing’s perfect,” said Casse, the son of trainer Mark Casse who oversees his father’s stable at Churchill Downs. The younger Casse said his father would be at Churchill Downs on Saturday for a four-furlong work that would be the final pre-Derby training move by the son of Malibu Moon. International Star: Ken and Sarah Ramsey’s International Star, winner of the Louisiana Derby (GII) and the points leader on the “Road to the Kentucky Derby” Leaderboard, came out of his Saturday work at Churchill Downs well, according to trainer Mike Maker. The son of 2000 Kentucky Derby winner Fusaichi Pegasus breezed five furlongs in 1:01.80 under jockey Miguel Mena. International Star returned to Maker’s base at Trackside training center after the work, but will return to Churchill Downs this week and will remain at the track through his Kentucky Derby run. Maker said Saturday that the colt would return to Churchill Downs on Monday or Tuesday, but said Sunday that the plan had changed and the four-mile journey from Trackside had been pushed back to later in the week. Far Right: Robert V. LaPenta and Harry T. Rosenblum’s Arkansas Derby runner-up Far Right galloped 1 7/8 miles over sloppy footing during Sunday’s training session for Derby and Oaks horses. Trainer Ron Moquett said the winner of the Southwest (GIII) and Smarty Jones at Oaklawn Park would work on Saturday or Sunday. War Story: Loooch Racing Stables and Glenn K. Ellis’ War Story galloped early Sunday over a fast track at Churchill Downs. 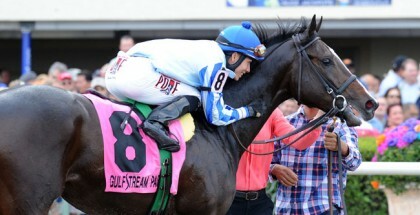 Trainer Tom Amoss said the Risen Star (GII) runner-up is scheduled to work on Wednesday. Mr. Z: Four-time Kentucky Derby-winning trainer D. Wayne Lukas said Zayat Stables’ Mr. Z, third in the Arkansas Derby, would work on Wednesday or Thursday. The Malibu Moon colt galloped over a sloppy track during Sunday’s training window for Derby and Oaks runners. 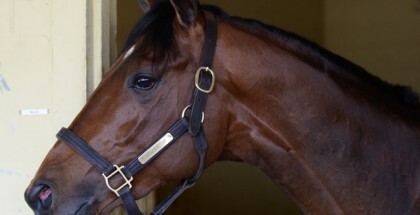 Tencendur: Stall manager Steve Hargrave reports Philip S. Birsh’s Wood Memorial runner-up Tencendur, trained by George Weaver, is expected to arrive Monday after a van ride from New York. Bold Conquest: On the Churchill Downs track for trainer Steve Asmussen was Ackerley Brothers Farm’s Bold Conquest, a Kentucky Derby candidate who galloped during the 15-minute training window for Kentucky Derby and Kentucky Oaks contenders on a track rated sloppy from rains that started shortly after the Churchill Downs track opened for training. Asmussen said Bold Conquest, runner-up in the Iroquois (GIII) at Churchill Downs and third in the Rebel (GII) at Oaklawn Park, would work Monday. He said Monday’s weather would determine whether the son of two-time Horse of the Year Curlin would work shortly after the track opens for training at 6 a.m. or during the training period for Oaks and Derby horses. Ocho Ocho Ocho: Delta Jackpot winner Ocho Ocho Ocho, third in the Blue Grass Stakes on April 4, will run in the Kentucky Derby, trainer Jim Cassidy said. He said the mount on Ocho Ocho Ocho was still open. Materiality & Stanford: Alto Racing’s Materiality, who captured the $1 million Besilu Stables Florida Derby (G1) at Gulfstream Park on March 28, tuned up for a scheduled start in the Kentucky Derby (G1) on May 2 with a sharp five-furlong breeze at Palm Beach Downs Saturday. The undefeated Todd Pletcher-trained colt worked in company with Louisiana Derby (G2) runner-up Stanford. The stablemates were both timed in 1:00.52 for their final Triple Crown tune-ups at Palm Beach Downs before shipping to Kentucky Tuesday. “It was a super work,” Pletcher said. “I’m very happy with him.” Daily Racing Form’s Mike Welsch, who clocked the important workout, reported that Materiality galloped out six furlongs impressively in 1:13.91. Itsaknockout: Itsaknockout: Pletcher-trained Itsaknockout, the Besilu Stables Fountain of Youth (G2) winner through the disqualification of Upstart and the fourth-place finisher in the Florida Derby, breezed a half-mile in 48.17 seconds while working in company with Competitive Edge, his undefeated stablemate. El Kabeir: Calvin Borel, who has already won the Kentucky Derby three times, was officially announced the jockey for 2015 Kentucky Derby contender El Kabeir. Justin Zayat of Zayat Stables confirmed the news with the Courier-Journal on Sunday. Christine A. Moore Millinery will be hosting a Trunk Show on April 27-30 at Rodes for Her located at 4938 Brownsboro Rd. Louisville, Kentucky 40222. The Permanently Disabled Jockey Fund brings jockeys together to serve up “Jocktails” on Thursday, April 29, 2015 from 7:00pm-10:00 at the Ice House in downtown Louisville located at 217 E. Main Street. Tickets are available online now and won’t last. Only 100 tickets are available to the public! Team Lady and The Track and Fashion at the Races invites you to a casual Meet & Greet at the Galt House Hotel on Thursday, April 30, 2015 from 6:00-8:00 pm located at Al J’s Conservatory. The 30-ft aquarium bar with sweeping views of downtown Louisville is the perfect place to enjoy a cocktail and celebrate the 141st Running of the Kentucky Derby while becoming acquainted with like-minded horse racing friends. Lady and The Track is collecting videos once again for the 2015 Kentucky Derby Fan Video Montage. If you’d like to join in on the fun simply email a short video clip to casey@ladyandthetrack.com. Please include your name, location, favorite Kentucky Derby horse, and how you’ll play your ticket in your video. All videos must be less than ten seconds long and must be filmed “sideways” by holding your phone horizontally while filming. All video submissions must be emailed in before 12:00 pm ET on Tuesday, April 28, 2015. American Pharoah galloped in the rain under Jorge Alvarez over sloppy footing during the training window for Kentucky Oaks and Derby horses on Sunday, April 19, 2015. A live video stream of morning workouts at Churchill Downs is available every morning from 8:00am-9:00am ET. Kentucky Derby and Kentucky Oaks contenders take to the track for training between 8:30am-8:45am and wear specially designed saddle towels embroidered with their names. Kentucky Derby contenders wear a brightly colored greenish-yellow towel while Kentucky Oaks contenders wear pink. The live stream is an excellent way to get to know your 2015 Kentucky Derby contenders a little better even if you’re clear across the country. The post position draw for the Kentucky Oaks is scheduled for Tuesday, April 28, 2015. The post draw for the 141st running of the Kentucky Derby is set for Wednesday, April 29, 2015 at 5:30 pm ET at Churchill Downs. The traditional pill pull will be televised on NBCSN.